The US was authorized by the WHO to develop its own country specific adaptation of the WHO’s now retired ICD-9, called ICD-9-CM, and has been slow to move on to a “Clinical Modification” of ICD-10. Rather than skip ICD-10 and move straight onto ICD-11 in 2015, the National Center for Health Statistics (NCHS) has been developing a “clinical modification” of ICD-10 called ICD-10-CM. This development process has been in progress for a number of years. So ICD-10-CM is US specific and it’s scheduled for implementation in October 2013 . The US does not envisage moving on to ICD-11 (or an adaptation of ICD-11) for many years. So although the majority of countries will be implementing ICD-11 in 2015+, the US will sail on with ICD-10-CM. Several other countries use a modification of ICD-10. Canada is authorized to use its adaptation of ICD-10, ICD-10-CA. According to one source, Canada may not adopt ICD-11 (or an adaptation of ICD-11) until beyond 2018. The US clinical modification is proposing to retain CFS in the R codes and to classify it at R53.82 in Chapter 18, rather than code CFS in Chapter 6: Diseases of the nervous system, along with ME and PVFS, at G93.3. 1 The International ICD-10, which is used in the majority of countries. 2 The Canadian Clinical Modification ICD-10-CA. 3 The German Clinical Modification ICD-10-GM. 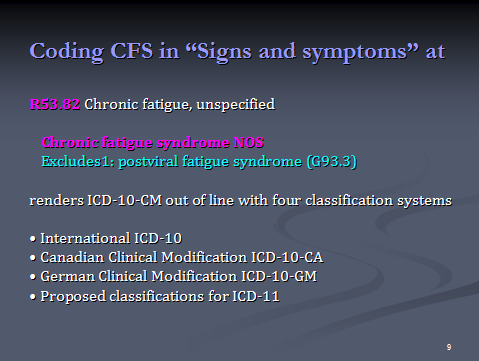 4 The proposals for Chapter 6 of ICD-11 as they stood in the iCAT ICD Revision Platform at November 2010, where CFS is proposed to be classified in Chapter 6: Diseases of the nervous system, with (B)ME specified as an Inclusion to CFS. This issue is proving divisive because some US patients would prefer to see CFS split from ME in ICD-10-CM. But retaining CFS in the R codes and placing it under the R53: Malaise and fatigue parent category may have considerable implications for patients who already have a diagnosis of CFS or who may receive a diagnosis of CFS in the future – for the treatments that are provided, the care packages received and for medical and disability insurance. So I consider it will hurt patients to have CFS coded under the R chapter, rather than in Chapter 6: Diseases of the nervous system and that coding CFS under “ill-defined conditions” will render CFS and ME patients more vulnerable to the current proposals for the revision of the “Somatoform Disorders” section for DSM-5 . If I were a patient who already had a diagnosis of CFS or might be given diagnosis of CFS in the future, I would feel safer if CFS were coded at G93.3, until the science has got it sorted. For there are no guarantees that US medics will diagnose ME and use the new ME code for billing purposes. But this is not a new issue. US patients organizations, advocates and patients have known about these proposals for several years. The issue has been discussed at meetings of the Chronic Fatigue Syndrome Advisory Committee (CFSAC). CFSAC provides advice and recommendations to the Secretary of Health and Human Services via the Assistant Secretary for Health of the U.S. Department of Health and Human Services on issues related to chronic fatigue syndrome (CFS). Copies of meeting agendas, minutes, recommendations, some presentations and since 2009, videocasts of entire meeting proceedings, can be accessed from the CFSAC pages. Minutes of meetings go back to September 2003 . The codings issue had been discussed by CFSAC in June 2004 and again in September 2005, when a presentation had been given by the CDC’s Donna Pickett. In 2005, the committee had recommend that CFS be classified under G93.3. The issue was discussed more recently, at the May 2010 CFSAC meeting. During the last ten minutes of that meeting, Dr Lenny Jason discussed his concerns with the committee that the placement of CFS in ICD-10-CM under the Chapter 18 “R” codes could be problematic. chronic fatigue syndrome, unspecified (in the signs and symptoms chapter). 3. Adopt the term “ME/CFS” across HHS programs. 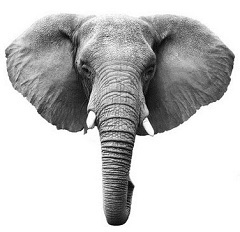 I hope further discussion of ICD-10-CM codings can be pushed back up the agenda for the next CFSAC meeting because a number of issues were left hanging. Although ICD-10-CM is not scheduled for implementation until October 2013, it had been proposed that at some point prior that date codes might be “frozen”. At the ICD-9-CM Coordination & Maintenance Committee Meeting on Sept. 15, 2010, it was announced that the committee had finalized the decision to implement a partial freeze for both ICD-9-CM codes and ICD-10-CM and ICD-10-PCS codes prior to implementation of ICD-10-CM on Oct. 1, 2013. As of October 1, 2011, only limited updates will be instituted into the code sets so that providers, payers, clearinghouses, and health IT vendors will not have to simultaneously keep pace with code updates while also reconfiguring their existing systems for ICD-10-CM/PCS. So the clock is ticking and US advocates and patients need to be aware of how little time may be left. A few days ago, I contacted Donna Pickett, Medical Systems Administrator, Classifications and Public Health Data Standards, National Center for Health Statistics, Centers for Disease Control and Prevention (CDC) to enquire whether the proposed date by which ICD-10-CM codings might be “frozen” had been finalized. Ms Pickett has provided information regarding the freezing of the ICD-9-CM and ICD-10-CM code sets. She also confirmed that Clinical criteria and diagnostic guidelines will not be included in ICD-10-CM. • The last regular, annual updates to both ICD-9-CM and ICD-10 code sets will be made on October 1, 2011. •On October 1, 2012, there will be only limited code updates to both the ICD-9-CM and ICD-10 code sets to capture new technologies and diseases as required by section 503(a) of Pub. L. 108-173. • On October 1, 2013, there will be only limited code updates to ICD-10 code sets to capture new technologies and diagnoses as required by section 503(a) of Pub. L. 108-173. There will be no updates to ICD-9-CM, as it will no longer be used for reporting. • On October 1, 2014, regular updates to ICD-10 will begin. The ICD-9-CM Coordination and Maintenance Committee will continue to meet twice a year during the partial freeze. At these meetings, the public will be asked to comment on whether or not requests for new diagnosis or procedure codes should be created based on the criteria of the need to capture a new technology or disease. Any code requests that do not meet the criteria will be evaluated for implementation within ICD-10 on and after October 1, 2014 once the partial freeze has ended. Codes discussed at the September 15 – 16, 2010 and March 9 – 10, 2011 ICD-9-CM Coordination and Maintenance Committee meeting will be considered for implementation on October 1, 2011, the last regular updates for ICD-9-CM and ICD-10. Code requests discussed at the September 14 – 15, 2011 and additional meetings during the freeze will be evaluated for either the limited updates to capture new technologies and diseases during the freeze period or for implementation to ICD-10 on October 1, 2014. The public will be actively involved in discussing the merits of any such requests during the period of the partial freeze.